Nestled in a green oasis overlooking the Saronic Gulf Sea, you will experience relaxing holidays and unique moments of leisure. 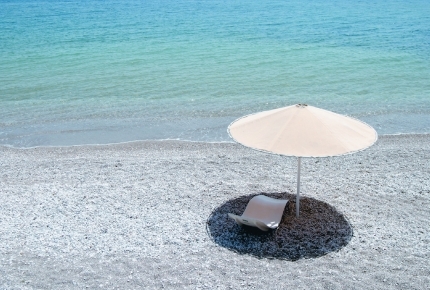 Kalamaki Beach 4 star Hotel lies on a beautiful organized beach perfect for sunbathing under Greece’s blue sky. You and your family will share special moments, enjoying sports and leisure activities. Only one hour from Athens and close to famous sightseeing areas, your eyes will be amazed by the beauties of the Peloponnese. Located in Isthmia, Corinthia, Kalamaki Beach Resort is easily accessible from Athens city center and Athens International Airport (ATH). The hotel’s immediate area offers you a large choice of famous archaeological sites and attractions to visit: the theater of Epidaurus, Mycenae, Nafplio and Delphi to name a few are very close by. 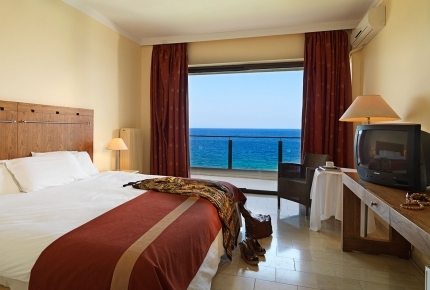 Beautifully furnished, the large and bright rooms boast unique sea and lush garden views. The 4 star hotel’s organized beach with grass and white pebbles and is supplemented by two swimming pools, green lawn spaces and sports facilities that include 4 tennis courts of green quartz sand (canada-tenn), a volley ball court with grass, a fitness room, a billiard table, a table tennis and a playground for children. At the Kalamaki Beach resort you will also enjoy Greek and International cuisine by our chef. Dreamy weddings and receptions are celebrated by the pool and thanks to the Homer Stathopoulos meeting room, Kalamaki Beach Resort is the perfect venue for meeting and events. With 40 + years of Greek hospitality experience, our team guarantees a blissful stay and relaxing daytrips away from the city. Book direct to benefit from exclusive special offers. Book Now & Pay Now! Rate includes Breakfast Buffet, Dinner, Free Wi-Fi in the lobby and all taxes. Special payment conditions apply. Benefit from Free cancellation PLUS Breakfast Buffet, Dinner, Free Wi-Fi in the lobby and all taxes included! Only available on the hotel’s website. Hiking lovers can enjoy unique hiking trails in Corinth, combining the action with their accommodation in Kalamaki Beach Hotel. Paths of past centuries, ancient trails, where the hiker will encounter watermills, Byzantine monuments and chapels, fountains, wells and bridges, Byzantine castles and the villages of the surrounding area. The naturalist is led in an imposing, rocky and full of historical memories landscape of natural tranquility and beauty that inspires, rests and revitalizes... Suggestions : Agios Vasilios - Stefani, Dervenakia - Stefani, Mycenae - Tenea, Onia Mountains, Gerania Mountains, Perachora - Iraio, etc. For information and reservations, please contact our Sales Department at sales@tourhotel.gr or call us at +30 210 3235605 (office hours).